Everybody knows air guitar, yet U.S. Air Guitar (usairguitar.com) is its own animal. A combination of rock and performance art, air guitar is a creative outlet--a chance to be a rock star for a few minutes. Anybody can do it, no equipment or lessons necessary, making it one of the few truly democratic art forms around. 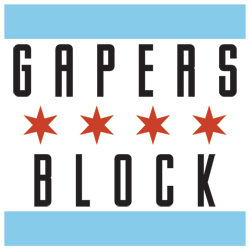 Tonight in Chicago, locals compete for the regional championship--the winner going on to compete in San Francisco Finals on August 8. The U.S. champion of that event gets the big prize of the deal--the chance to represent the U.S. and compete in Finland at the Air Guitar World Championships, the Olympics of Air Guitar. Strange as it sounds, Air Guitar as a competitive "sport" was founded in Finland, not in the U.S., the birthplace of rock-n-roll. A group of Finnish students initiated the championship in 1996, with the ideal of promoting peace as a motto. They believed that if everyone played air guitar, nobody would hold a gun. 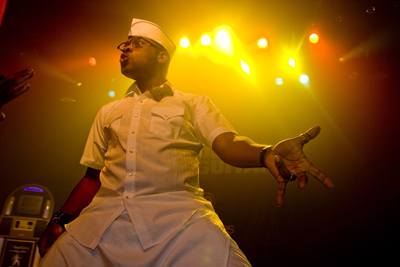 The championship came stateside in 2002, with the help of New York branding representatives Cedric Devitt and Kriston Rucker, now the co-commissioners of U.S. Air Guitar. Having read about the Finland event in the Wall Street Journal, Rucker immediately told his buddy Devitt about the typically American event that appeared to be excluding Americans. "I was shocked that the U.S. was not represented," says Rucker. The two friends headed to Oulu, Finland to investigate then returned to set up the U.S. version in 2003. In just five years, U.S. Air Guitar developed its own eclectic flavor. Past judges include author Malcolm Gladwell, Rachel Dratch of Saturday Night Live, and Jason Jones from the Daily Show. A motley crue of people are attracted to Air Guitar, from punk rockers to accountants and doctors. "I've seen old men, 16-year-old girls, architects from London," notes Bjorn Turoque (Dan Crane), a second place N.Y. winner who became MC and ambassador of U.S. Air Guitar, author of To Air is Human, and star of the film, Air Guitar Nation. "All walks of life are welcome." The democratic element is perhaps the biggest appeal of Air Guitar. No specific background in necessary. "There is no type of person who wouldn't be a good at air guitar," says Rucker. How it works is simple. Contestants sign up for any number of regional championship by going to the website, picking a city and signing up. Many have never learned been in a band or learned how to play an instrument. They pick out a killer costume, prepare a song and get sixty seconds to rock out on stage. If they make it to the second round they get two minutes on stage. Although it sounds simple enough, competition is fierce and preparation is essential. "Originally I didn't train at all," notes Turoque. "I got drunk and went on stage, ended up in second place." In subsequent years, however, Toroque learned the importance of training, spending several weeks before a championship working on his moves. The bigger Air Guitar gets, the higher the level of performance is required. Contestants often watch videos of past shows to prepare. "The more people do it, the more they train and work harder," says Rucker. And Air Guitar is growing. 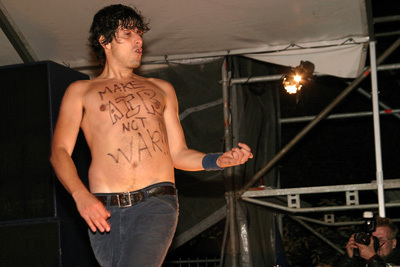 Last year U.S. Air Guitar championships occurred in fifteen cities; this year they're up to twenty-three. There have been two American World Champions: C. Diddy (David Jung), in 2003, and Sonyk Rock the following year. According to Rucker, winning is about exuding a certain combination of charisma and air guitar style. "You gotta be able to rock a crowd on stage. You gotta have that je ne sais quoi weirdness that's kind of hard to define." It's not easy to be good at Air Guitar, but there are perks for those who manage to win. Winners get to be a bit of a star for a while, travel around the world, go on talk shows, etc. In the words of Bjorn Toroque: "I would say in no uncertain terms Air Guitar has changed my life, for the better. I entered this competition, the very first in U.S., on a whim in 2003, since then I've logged countless air miles, met lots of air groupies. I've been around the world, all in the in pursuit of an enviable art form." For Devitt and Rucker, Air Guitar is a sport that belongs up there with the other American greats—baseball, basketball and football. "We're trying to create America's fourth sport," notes Rucker. "Soccer is trying to but we don't think its' going to work out." As Rucker points out, Air Guitar is more American than soccer. "Almost everybody does it, whether they realize it or not. Arguably, this is the home of rock-n-roll." Without a background in music or knowing how to play the guitar, Air Guitar provides unknowns the opportunity to perform at some of the country's biggest venues, like the Bowery Ballroom in New York, or the Roxy in LA. And for the audience, the show is immensely appealing. "I've had people come up afterward and say it was the best concert they've seen in fifteen years," says Toroque. "It's like great rock combined with a great piece of performance art, and then put into a sports environment, where it's competitive, so it's a bit of everything," says Rucker. Open to all, Air Guitar is like American Idol yet without the necessity for extensive training and exceptional musical talent. "People expect air guitarists to be losers with mullets who live with their parents, and often that is the case. But often there are some spectacular performers out there," says Toroque. For the Chicago regional, eyes are on Nordic Thunder, the 2006 Chicago winner. Rucker sees Air Guitar becoming more commonplace. "I think it's the kind of thing that bigger it gets the better it gets. With Air Guitar, you feed off the crowd, who legitimates you being up there. Every year its getting bigger so the more the merrier." 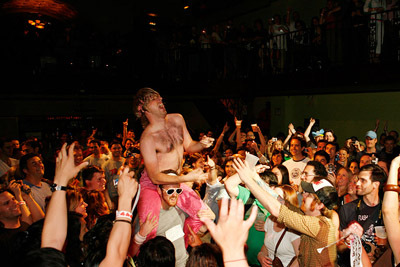 The 2008 Cuervo Air Guitar Championships, Chicago Regional tournament occurs tonight at the Metro. Doors open at 8pm; show at 9pm. Tickets are $14. 18 and over. 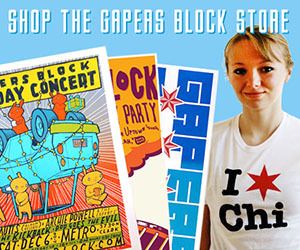 Marla Seidell is a Gapersblock contributor. If you post about this again, I'd LOVE to see some video!